With his glaring eyes and razor-sharp gnashers, one of the most menacing-looking underwater lurkers of the St Andrew’s Aquarium is the majestic moray eel. Although their startling looks have earned them a scary reputation, moray eels are actually quite shy, much preferring to curl up in an off-shore rock crevice than to take a chomp at human flesh! Found in tropical and temperate areas all over the world, moray eels seek out much cosier waters than you’ll find in the North Sea, and thrive in tropical coral reefs. 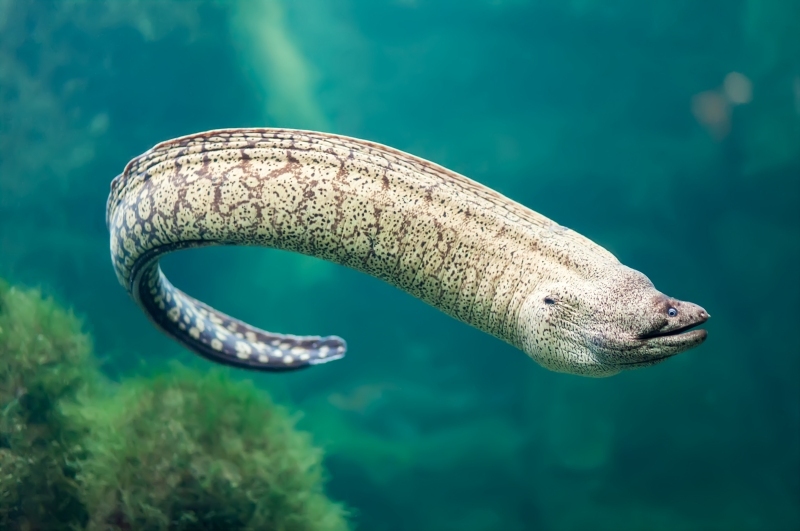 They range from a piddling 6 inches to a whopping 13 feet long, making them the largest variety of eel in the world. These carnivores ambush their prey by slithering unseen through shadow and rock until an unsuspecting fish, octopus or crab happens to dart, float or amble by. The poor victim is either squashed by the moray’s strong, constrictive body or shredded up its terrifying jaws. Because they don’t have tongues, moray eels have a bizarre method of moving their prey to the back of their mouth and down their gullets. They do this with their sinister second set of teeth – their pharyngeal jaws – which can actually move up the throat to grab the morsel of food caught in their teeth. If this isn’t scary enough, once an eel bites down, they don’t release, so many divers have actually lost fingers through hand-feeding them! Moray eels don’t have very good vision, which makes them vulnerable to sharks, barracudas and other large, underwater predators like sea snakes and groupers. Some varieties produce protective mucus which covers their bodies in toxins, which can lead to a nasty surprise for hungry predators that decide to sample a bite. 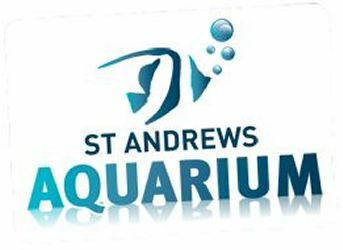 You might see the eel at St Andrew’s Aquarium open and close its mouth over and over. Though it might look threatening, it’s actually to flush water over its gills, and important for respiration! 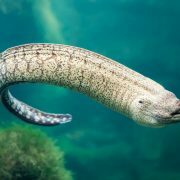 Unlike many fish, moray eels can swim in reverse. Little shrimps and wrasse fish live on the moray eel’s body, and eat the various parasites that crawl around on its skin. Moray eels can have black, brown, olive, green or even a fetching variety of leopard spotted skin, it all depends on their habitat. The female moray will lay up to 10,000 eggs during mating season, but many will perish in the stomachs of predators before they metamorphose into baby eels.